We’ve taken your favorite sandwiches and crafted the best possible versions of each. From Grinders to Gyros, and from vegan to bacon, these are the “faves” you’ll crave. Join Vibe Club™ Rewards and exclusive rewards for doing what you already do. Download the new Which Wich Mobile App to get started! Need Catering?We've got you covered. From vegetarian or vegan Wiches and wraps to our signature five-meat, three-cheese Wicked®, we can truly cater to any taste. Let us handle your next event! 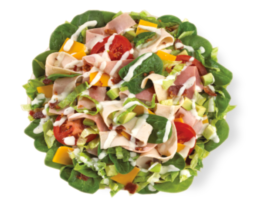 Order any of our sandwiches as a salad, LettuceWich™ or spinach tortilla wrap. Project PB&J provides food, comfort and a little happiness to the people who need it most. Find out how you can help!